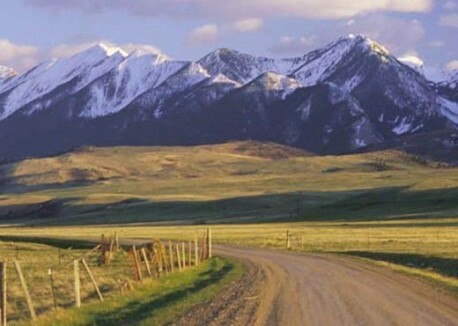 The Central Montana Section serves the counties of Blaine, Cascade, Chouteau, Gallatin, Glacier, Hill, Madison, Meagher, Park, Sweetgrass, and Toole. Click here for the details and sign up for our next event. The concept of â€œblockchainâ€� processing is appearing more and more frequently in technical discussions about databases and transactional registries. Perhaps the most recognized use of blockchain techniques is in the cryptocurrency known as Bitcoin. Prof. Mike Wittie from the MSU School of Computing will give a laymanâ€™s introduction to the terminology and principles of blockchain transactions, and explain how and why the distributed ledger and cryptographic techniques of blockchain computing are important for us to understand. Please be sure to sign up here. Thank you! Presenters: Blackmore Sensors and Analytics, Inc.
Blackmore is a Bozeman start-up company specializing in applications of compact frequency-modulated continuous wave (FMCW) LIDAR (lightwave radar) and supporting analytic tools and software for use in imaging, detection, and autonomous vehicle applications. The Blackmroe LIDAR technology allows detection of velocity at every point within a scanned scene. The presentation will include some history of the company, a summary of key technological innovations, and a description of the companyâ€™s products and focus areas. We have seen many changes in the past 40 years, and many fascinating and unexpected changes are yet to come. The rapid pace of technology, engineering practice, and market changes, calls for both students and practicing engineers to take a broad mixture of subjects in school and a wide range of continuing education topics after college. The ability to create a professional network with current classmates and co-workers, and the importance of professional societies such as IEEE, will really pay off through the twists and turns of a successful career. Amy and Dennis will use examples drawn from contemporary technology to show how fast things are changing - and emphasize the need to learn to handle/expect disruptive technology changes and the inevitable changes in their careers. As a husband and wife team, both electrical engineers, Dennis and Amy can also address workplace issues and how to handle them. The meeting is open to IEEE members, students, and guests. Please RSVP so we can arrange to have enough pizza! We will meet in the Barnard Hall atrium (formerly EPS) at 5:30PM for pizza and social time, then we will walk over to the Asbjornson construction site for the 6:00PM tour. What's an Enigma? Dramatized by countless books, TV specials, and movies, an Engima machine used by the Germans in World War II is currently on display at the American Computer Museum in Bozeman. This presentation will cover some brief history and then dive into the technical details of the Enigma. This presentation will include a lab portion where Engima simulators will be distributed to audience members who can then decode a message in the same manner used in the 1930s and 1940s! Harley Leach was involved in the Electrical and Computer Engineering department for nearly 40 years. First as a student and later as an instructor for EE and EEET classes. He continues to be a key contributor to the HAM radio club as a maintainer of many of the repeaters in the Gallatin Valley and beyond. Location: Barnard Hall (formerly EPS) in room 108 Time: 10/28/2016 Presenter: Jim Smith, P.E. What's the Big Deal with Battery Energy Storage? The presentation will discuss battery energy storage systems or BESS. Particular focus is on how BESS units are being used to store large amounts of electrical energy, how they are affecting the adoption rate of renewable energy generation, how they are affecting how utilities and consumers use the electrical grid, and how recent developments are affecting the economics of utility and consumer level energy storage. Medical imaging is going through some exciting technology changes as companies strive to make imaging equipment that is higher resolution, lower cost, and lower power. Integrated circuits are often the technology that enables companies to meet these goals. Don will talk about advances in imaging from a chip designerâ€™s perspective. Doug Brekke, P.E. has two college degrees, one in Communications and one in Electrical Engineering. â€œCommunicationsâ€� studies how organizations and relationships work (or donâ€™t work). Doug will provide suggestions for having successful relationships in an engineering workplace. Doug owns Black Box Design, a design/build company working on audio, video, and lighting control systems. Since 1980, Doug has worked on numerous projects for Montana State University. MSGC BOREALIS students and staff along with teams from Louisiana State University, University of Minnesota, Iowa State University and University of Colorado Boulder are developing the Common Payload for the NASA Spacegrant 2017 Eclipse Ballooning Project. With the underlying goal of student involvement, the Common payload will be replicated and distributed at a workshop to be held July 16-20, 2016 in Bozeman, MT. 65 Teams from across the country will build, test and ultimately fly the system during the total solar eclipse on 8-21-2017 that crosses the US from Oregon to South Carolina. The primary flight payload is a student designed and constructed low cost platform that can report balloon positions, stream video and take snapshot images all at altitude in real or near real-time. In order to accomplish this, the primary flight payload includes an Iridium satellite modem, still image Pi camera, HD video Pi camera, flight termination systems and power supply systems. The Iridium satellite modem provides updated latitude, longitude and altitude data allowing the ground station antennas to track the balloon throughout the flight and provides the FAA near real-time tracking information of the balloon. The ground station antennas allow communication both to and from the primary flight payload. Using a 900Mhz radio, students are able to interact with the still image camera settings and take â€˜on commandâ€™ images which are then transferred to the ground station. Steaming HD video from the edge of space to the ground requires a wide bandwidth, high speed link to transfer the large amounts of data. This task is accomplished by using an Ubiquiti modem operating at 5.8Ghz to transfer video data down to the ground station where the feed is then uploaded onto a site for public viewing. Finally, using the Iridium satellite modem, students are able to send a â€˜flight termination emailâ€™ to the payload which uses an on board XBEE radio to command the cut-down system to sever the cord between the payloads and balloon, effectively ending the flight. Come hear the â€œlatest newsâ€� as the eclipse primary flight payload is nearing its final stages of development and testing in preparation for distribution this summer. Presenters: John Carmody and Jonathan Shafer, NorthWestern Energy This presentation will cover the technical information on the currently installed Beckâ€™s Hill Microgrid Project in Deer Lodge, MT, which serves 17 customers and offers both customer and grid benefits. The Microgrid is comprised of 80kVA/183.4kWh of battery storage as well as 40.26 kW of solar photovoltaic. Furthermore, the presentation will discuss how the Microgrid pilot project plays into NorthWestern Energyâ€™s larger strategy in applying technology to optimize assets and increase the gridâ€™s reliability for their customers. Join Bryan Robertus of local product development firm Advanced Electronic Designs as he talks about Star Wars, M&M's, Flying Pigs, EBI (Engineering Before Internet) and light graffiti in the context of electronics engineering and product development over the past quarter century. Interwoven throughout this tech trek traversing googols of clock cycles will be lessons learned and guiding principles that have stood the test of time. Dr. Chris Colson will present a talk entitled, "Why smart grids still matter: A utilityâ€™s perspective." Adoption of smart grid concepts and technology remains a significant challenge for utilities, large and small. What are some of the hurdles? With so much great research and development, are utilities paying attention? What are utilities up to in the prevailing market-driven environment? Chris will examine current events facing electric generation and transmission utilities in the United States, as well as discuss smart grid topics of interest in the mountain-west region and beyond. Mr. Paul Bockus is Business Development Director for Absaroka Energy. He will be joined by the president of Absaroka Energy, Mr. Carl Borgquist, to discuss the Gordon Butte Project. The Gordon Butte project is a pumped storage hydroelectric project located in central Montana near Martinsdale. "One of the issues facing renewable energy in Montana is storing the energy produced during periods of low demand such as night. Pumped storage is one method to store this energy so it can be used during peak demand. With pumped storage, during the periods of low demand excess electricity is used to pump water to an upper reservoir. When the electricity is needed the water from the upper reservoir is discharged through a turbine into the lower reservoir. The Gordon Butte Hydro Pumped Storage Facility will consist of upper and lower closed-loop reservoirs connected by an underground concrete and steel-lined hydraulic shaft. Each reservoir will be approximately 4,000 feet long and 1,000 feet wide with depths of 50 to 75 feet. As currently designed, an underground powerhouse with four turbine-generators would be located at the bottom reservoir. These generators would provide an installed capacity of 400 megawatts, allowing for an estimated annual energy generation of 1300 gigawatt hours. This facility will provide ancillary and balancing capabilities to Montanaâ€™s emerging renewable energy industry, as well as, provide multiple services to facilitate stability, reliability, growth and longevity to existing energy infrastructure and resources in the state and region." "Industrial CCD Camera Internals" Jon Koon will start with a brief introduction to CCD technology and its applications. The meeting will then proceed with a tear-down of an actual camera with discussion of all major design components and challenges. Several subsystems will be passed around including CCD sensors, cooling system components, optical filters, control electronics and more! Dr. John Paxton will present a talk entitled "Strategies to Broaden the Appeal of Computer Science." Don Wilson will discuss the new repeater for the Search and Rescue. The IEEE Central Montana Section helped to fund a new repeater for the Search and Rescue. Dr. Doug Cairns will address UAV technology development, regulations, and anticipated emerging civilian market opportunities. He will provide an overview of how UAVs fit in with work being conducted at MSU and around the state, including opportunities for collaboration. Doug Cairns is a Professor of Mechanical Engineering of the Mechanical & Industrial Engineering Department at MSU. Prior to coming to MSU, he was Manager of Composites Technology at Hercules Materials Company (Now Hexcel) where he conducted research on composite materials applied to primary structure. He has a B.S. and M.S. from the University of Wyoming, and a Ph.D. in Aeronautics and Astronautics the Massachusetts Institute of Technology. He is a Member of ASME (Composite Materials Subcommittee), AIAA (past Materials Technical Committee Chairman). He is Chairman of the Mechanical Engineering Graduate Studies Committee. Eric Moog will present a talk entitled "Experiences as a electrical engineering graduate working in the Gallatin valley." Eric Moog graduated from MSU with a BSEE in 2009 and received an MSEE in 2011 under the advisory of Dr. Steven Shaw. After completing his Master's Degree, Eric went to work at ILX Lightwave as a Product Engineer and Project Manager developing precision temperature controllers for laser diode research applications. Towards the end of 2013 he transitioned to a role as Chief Electrical Engineer at Montana Instruments, a local optical cryogenics company and affiliate of Quantum Design. There, Eric developed a high-power, water-cooled electromagnet system for use with Montana Instrument's optical cryostats as well as R&D and preliminary design of next-generation atomic-scale positioning systems. Since early 2014, Eric has been employed in Bozeman as Senior Design Engineer at Geoforce Inc. developing intrinsically safe developing satellite tracking devices for the oil and gas industry. "The Taylor Planetarium is one of only a few planetariums in the world that offer advanced, Digistar 5 projection technologies. Developed by Evans & Sutherland, this state-of-the-art projection system allows visitors to experience our universe and our world in vivid colors, dramatic motion and brilliant displays of light." Eric Loberg, planetarium director and MSU CS alumnus, will talk about the planetarium's state-of-the-art digital projection system and give a behind-the-scenes look at the planetarium's video and audio facilities. There will be demonstrations and time for questions. Pizza and social time at 5:30 in the MoR lobby, demo starts at 6:00. Luke Mauritson has agreed to host the Central MT Section IEEE at his engineering and manufacturing facility, Montana Instruments. The event will be a tour of Montana Instruments while Luke tells us about the technologies developed to make optical samples as cold as 3 degrees Kelvin. That is a mere 3 degrees before all known motion stops. Montana Instruments is making international sales to researchers and scientists that investigate the interaction between cold solids and light. At the november 19th, 2011 MGA Board meeting, the board of directors approved a name change for our section. Our section name has changed from "IEEE Montana Section" to "IEEE Central Montana Section." The name change serves to harmonize our section's name with our neighbors in the Western Montana Section and Eastern Montana Section. Dr. James W. Howard Jr.
Bridger Photonics, Inc. was founded in 2006 and ranked 146 on Inc. magazine’s list of the 500 fastest growing companies for 2011. This talk will provide a technical overview of Bridger Photonics’ three business areas and describe some of the challenges associated with starting up and running a high-technology company. Bridger’s core business areas include: precision ladar, precision lidar and advanced imaging. Download as PDF by clicking here. If you are an IEEE member, an engineering student, graduate student in technology, even a non-engineering student interested in technology, you know how knowledgeable research skills will contribute to your success. The Montana State University community has access to the IEEE Xplore, a digital library providing full text access to more than three million IEEE documents. Learn how to use IEEE Xplore in a "best practices" manner. This one hour talk and demo will cover all the latest features and insider tips when searching IEEE Xplore. Plus, learn what IEEE Xplore can do that Google can't! Technology is increasingly becoming an interdisciplinary field, as traditional silos give way to multidisciplinary analysis and solutions. In order to keep pace with rapid change, the IEEE has expanded its coverage of new and emerging technologies based on its core focus of Electrical Engineering, Electronics, and Computer Science. Learn about new content being offered by the IEEE including journals, eBooks, and conference proceedings. The IEEE is the world's largest technical membership association with over 400,000 members worldwide. Learn how the IEEE can contribute to your career and education. No longer just about Electrical Engineering, the IEEE has moved into a wide range of related technical disciplines. This talk explores how the IEEE furthers its members careers via the provision of networking opportunities and on-going technical education. Specific resources available to the Montana State University community and to IEEE members will be described and demonstrated. Hear from the following three individuals. the world's first microprocessor, the Intel 4004.
species in every ocean, on all continents. Join us on Linked In! The IEEE Montana Section has formed a group on Linked In. Click here to join. 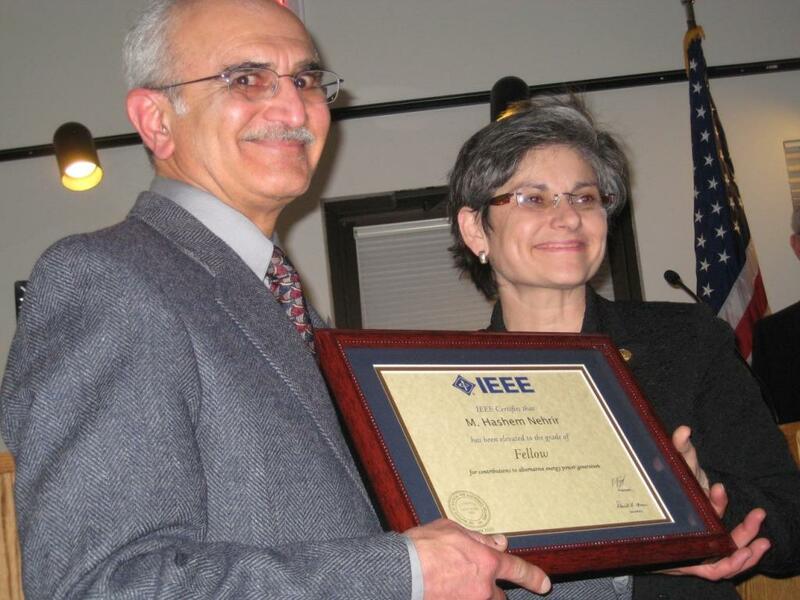 Dr. Waded Cruzado (right) presented the status of IEEE Fellow to Dr. Hashem Nehrir (left). Professors from the Electrical and Computer Department joined in congratulating Dr. Nehrir. Ross Snider will be our new Vice Chair / Chair Elect and Randy Larimer will continue as Secretary! Over 40 people voted online! Our annual mailing was distributed in November. It includes a summary of the activities that happen at our section and encourages inactive members to join us again. Download sthe annual mailing here. 2009-10-21: Dr. Bill Jameson wins Region 6 Leadership Award! At the IEEE Montana Section's October monthly meeting, section chair Mitch Hobish presented a Region 6 award to Dr. William Jameson. 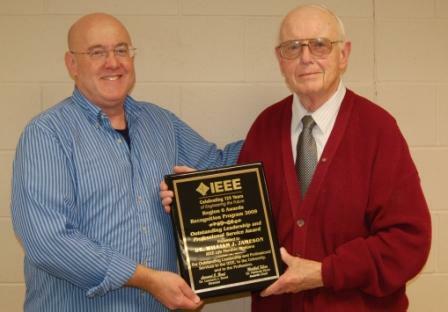 The plaque reads: "Outstanding Leadership and Professional Service Award, Presented to Dr. William J. Jameson, IEEE Life Member, Montana, For Outstanding Leadership and Professional Services to the IEEE, to the University, and to the Profession." 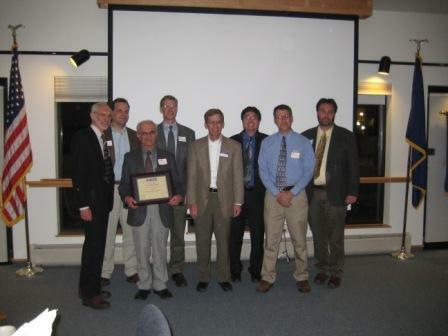 Dr. Jameson commented that he and other award winners before him are proud to be involved in the IEEE Montana Section and thought a Montana section meeting was the best place to accept such an award. Congratulations Dr. Jameson! © Copyright 2011 IEEE – All Rights Reserved. For questions or comments, please contact the Central Montana Section Webmaster.